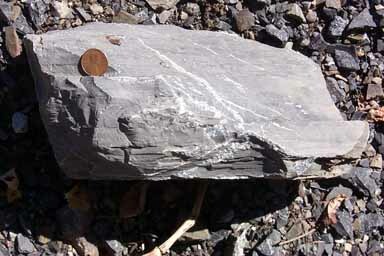 Dense, uniform, fine grained rock with conchoidal fracture. Faint, weak laminations running parallel to top of picture (see next to penny). The laminations are probably algal laminates, produced on tidal flats by colonies of blue-green algae. Micrite is one of the most common carbonate rocks. Most of what people call " limestone" is largely or exclusively micrite. As with clay (shale) it is deposited in generally quiet water, and appears in any environment where those conditions exist. Often we associate quiet water with deep water, where waves and currents do not touch bottom. But with carbonates that may not always be a good rule. Micrites (especially algal laminated micrites, as is this specimen) form readily in the upper regions of tidal flats (upper intertidal and supertidal), where periodic exposure to air is common.